They were simple bowls, smooth, white porcelain, vertical sides with rounded lip, sturdy — the stamp on the bottom said ‘1951' in black-bold numerals printed in a no-nonsense font. The shining stack of white entranced me when I first saw it, enough that I stood there awhile, taking a bowl from the top and caressing its side absent-mindedly, lost in novel consideration of a previously un-thought-of future, one with cupboards of my own where bowls would reside. I was seventeen. The bowls had caught my eye as I’d wandered through the store, just graduated from high school, working in retail, taking a year before deciding my future course. I’d never looked at *bowls* before. This was a new, grown-up, contemplation. I bought two. Two, as if one had been too lonely a concept to purchase and any more than two had far too much weight for my seventeen year-old self to bear. The two white bowls have resided in all of the homes I’ve lived in as an adult — an often vagabond life, touching down here, there, packing up and moving on, or moving back, two decades and more, the two bowls wrapped and re-wrapped in newsprint, then bubble wrap, tucked in something soft. Ironically, it was their utilitarian virtues that eventually gave them such indestructible value, grown from their ability to shine on both standard rental kitchen shelves as well as on rough-sawn planks I turned into a cupboard in the rustic kitchen I built while living in a canvas yurt. I lived there with my son for five or six of the warmer months, off in the Olympic rainforest in Washington State. The planks for the kitchen shelves I’d found in the back of the barn on the communal property where I rented the yurt, stacked in an old, forgotten tack room. There were other shelves in other homes. Shelves painted white where the bowls sat for a time, in a one-room cabin with loft in the redwood rainforest of northern California. There were shelves of old, well-used, raw Douglas fir, in a two-story octagon schoolhouse tucked in the back meadow of a hundred-acre farm. The dusty shelves of the long vacant octagon, when I first saw them, clearly showed paw prints from curious raccoons that had recently traveled through. That home, the octagon, sat on log rounds and hung over a small creek on the edge of wilderness on an old commune, deep in the Siskiyous in southern Oregon. During gatherings (which were rare during my era), Back Meadow was used for circles around bonfires with singing and chants, talks, workshops, music. It was also starting point for hiking the back country with its deer trails and hiking paths crossing pioneer tracks intersecting with old silver miners’ roads alongside Chinese-dug canals. I used to sit on the porch and dream of taking off on those trails, leaving all the difficulties behind; it was my two kids who kept me grounded and at home, who helped make anywhere we were, ‘home.’ Morning cereal in the two white bowls. Those bowls traveled well, too, tucked deep in U-Hauls on three cross-country moves, as well as in a cardboard box in the back of a canopied pickup two of my sons and I lived in for awhile. In that (thankfully short) era, the cardboard box would be placed each morning and evening on the picnic table bench by the fire at our campsite, the box being our kitchen cupboard at the time. Spoons, bowls, cups would be fished out, the bowls then filled with oatmeal or applesauce in the mornings, soup, canned spaghetti, or boil in bag dinners most nights, heated on the two burner propane campstove. On nights there was no propane, Topsy Turvy dinner would be declared, and breakfast cereal with bananas served in those bowls — or maybe Pioneer Night! with trail mix and a raw carrot on the side for each boy. I’d leave the leafy carrot tops on so my three and five year-old could play, “Ehh, what’s up, Doc?” as they ate. For two decades now, the bowls have lived mundane lives in suburban homes, faithfully serving up soups and chilis, cereals, snacks. Recently, though, small cracks have shown, tiny fissures from heat and cold, jostling and stress, over the years. The cracks had been there awhile, invisible at first or nearly so, then growing more defined, turning dark. I sometimes noticed, sometimes ignored, those signs of retirement in my bowls, those hairline cracks, marks of time and vigorous life. My mind, now, while looking in the mirror sometimes veers toward personal parallels; I will myself to resist. I am sturdy. I am strong. For the bowls, however, it was time. The two white bowls now sit on the dresser — my dresser, where formerly, earrings gathered in haphazard piles and necklaces handed down had hung inelegantly with pins stuck in the wall. I wasn’t ready to say goodbye to those bowls. They now hold jewelry. 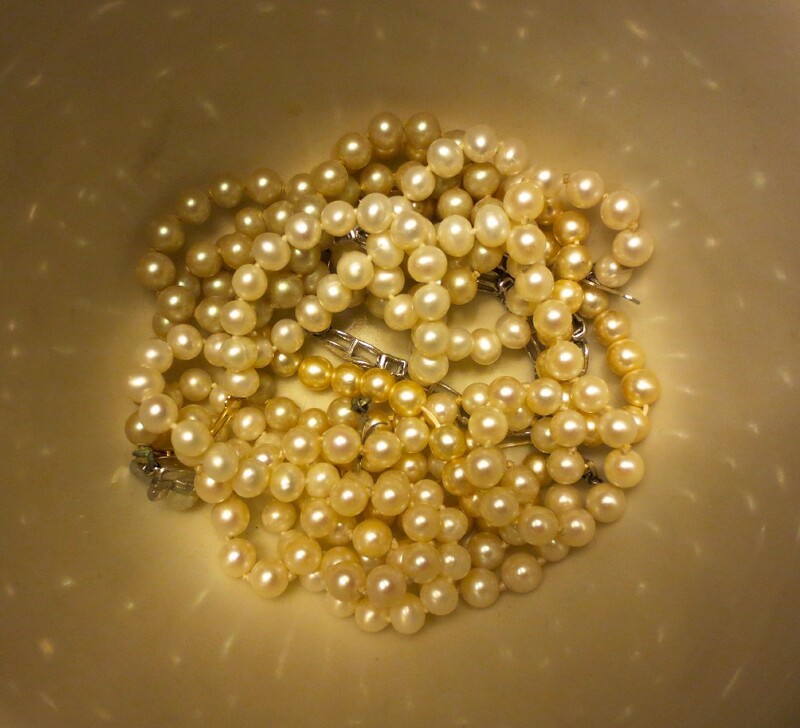 Inside the bowls, I have put pearls. With news of yet another death in my extended family this weekend I fell down the 'old blog post' rabbit hole before dawn this morning.... RIP Billy. Your own life's path helped give me strength to live life my own way, to be strong enough to leave a bad place when needed, and to not be afraid to be.... individual. Thank you. I thought you were going to say you dropped them. Transitioning to a new residence at the coast has forced me to look at my eclectic collection of totemic reminders of the past. Some will disappear at an upcoming garage sale. The keepers are already moved, set where I can see them walking into my new home office. The small wind up clock on the shelf behind my desk surrounded with images of ravens, sets there as company to the cedar flute and a kalimba. It has to be wound daily but is usually close enough and sure beats looking at some digital rendering of the time. Your comment wasn't showing when I typed Anna. As for people dying, it's been like a tsunami the past two years in my world. Just having to adjust that this is how it goes when you're lucky enough to be the one who stays alive awhile. Thanks for coming by, aka and Steel. And thank you, Steel! I loved my wandering phases. Living a settled life has turned out to be the tougher endurance, personally. I guess I am naturally a wanderer. I remember this post, Anna. It was a great pleasure to read it again. My condolences. What’s worse in your case is how many of those deaths were sudden. I’ll ask a stupid question: Why the photo of the pearls instead of a photo of the bowls? Antiques that became such while in your possession exude a kind of wisdom that comes with aging while remaining useful. Jon, thanks - and repurposing effectively, kind of the way to handle life sometimes, no? Ron, thank you. What a lovely comment, much, much appreciated. And I agree, Citizen Kane is one of the best. .... Hmmm, it's been awhile, maybe time to re-watch.